At least 12 civilians were killed in Donetsk after Ukrainian troops shelled the city from a neutral zone north of the airport, the republic’s officials said. Kiev has blamed rebels, though, calling the attack an attempt to undermine the Minsk peace talks. Two civilians were killed at a trolleybus stop. Five others died while waiting in a queue for humanitarian aid on Friday, according to the Donetsk People’s Republic’s (DNR) Defense Ministry. Five more were killed in the shelling of the city's Azotnoye district. “The cultural center giving out humanitarian aid was shelled, there are victims,” the city’s administration told local media. The attack was carried out from the nearby town of Opytnoye, which is “a neutral zone located to the north of Donetsk Airport,” the ministry told local media. Ukrainian military forces “approached it, shelled the city, and then moved back to their positions,” officials added. Russia’s Investigative Committee has launched a criminal investigation into the incident, committee spokesman Vladimir Markin told TASS. On the basis of the preliminary data, the involvement of Ukrainian troops and the National Guard are being checked first, he added. Meanwhile, the humanitarian headquarters has temporarily stopped aid distribution across Donetsk in order to keep locals and volunteers safe. Last week, 15 people were killed when shells hit a trolleybus stop in Donetsk. A couple days later, a residential area in the city of Mariupol came under fire. Thirty people were killed and 100 others were injured. Kiev accused the Donetsk Republic’s forces of the deadly attack, while the rebels denied their involvement in shelling the port city. On Monday, Kiev announced a state of emergency in the Donetsk and Lugansk regions, and put other Ukrainian regions on high alert. The Minsk peace accord on September 5 was signed by representatives of Russia and Ukraine, as well as Lugansk and Donetsk representatives. The deal was aiming to stop the military conflict in the Donbass region. Since September, all sides have repeatedly accused each other of ceasefire violations. Friday’s series of blasts in Donetsk was a “provocation” by the rebel forces, staged in order to “disrupt the peace process and the meeting of the Contact Group in Minsk,” claimed Ukrainian National Security and Defense Council press service representative Vladimir Polevoy. Ukrainian artillery, he added, “never did and does not shell the residential areas” of the city. However, it is the Ukrainian representatives who failed to attend the latest round of Minsk talks, Lugansk and Donetsk representatives told RIA Novosti. While representatives of eastern Ukraine came to Minsk on Friday morning ready continue dialogue, Kiev’s representative – former Ukrainian President Lionid Kuchma – failed to show up. “Unfortunately, the Ukrainian side didn't join [peace negotiations]. Ukraine is still avoiding dialogue,” Lugansk's Vladislav Deynego said. The latest meeting of the group – comprised of envoys from Kiev, DPR, LPR, Russia, and the Organization for Security and Co-operation in Europe (OSCE) – was supposed to take place on Friday. OSCE chairman and Serbian Foreign Minister Ivica Dacic urged all sides earlier on Friday to renew the Minsk peace dialogue. “I urge all sides involved in the conflict to stop the hostilities and return to the negotiating table. The international community expects the signatories of the Minsk documents to honor their commitments and pave the way for a peaceful resolution of the conflict,” Dacic said. 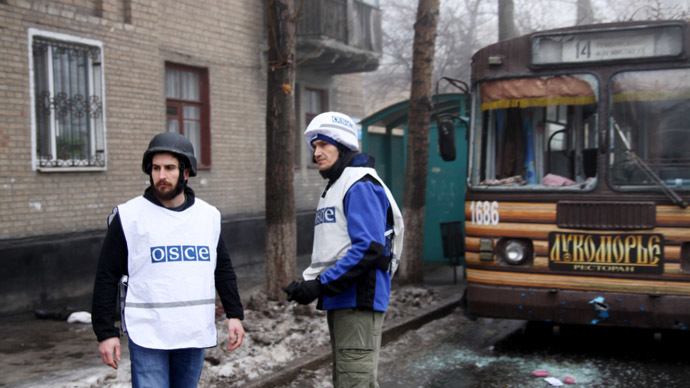 Meanwhile, the OSCE’s Heidi Tagliavini claimed she “could not reach” members of the self-proclaimed republics. “They have all of my phone numbers. Phones are constantly on. Also there is the Foreign Ministry of Belarus though which contact could be made,” Pushilin told Sputnik. Before their departure from Minsk, the republics’ envoys said in a joint statement that they are ready for a ceasefire if Kiev follows through with its end of the bargain. Yet representatives warned that unless Kiev honors its commitment, the fighting will go on. “If the negotiation process fails and shelling of residential areas in DPR and LPR continues, we reserve the right to continue our offensive until the territories of the Donetsk and Luhansk regions are freed,” the statement reads. Later in the day, Kiev’s representative said that “provisions are being finalized” for the delegation to come to Minsk on Saturday. “We are still planning to come,” Kuchma added, according to the Ukrainian News Agency.